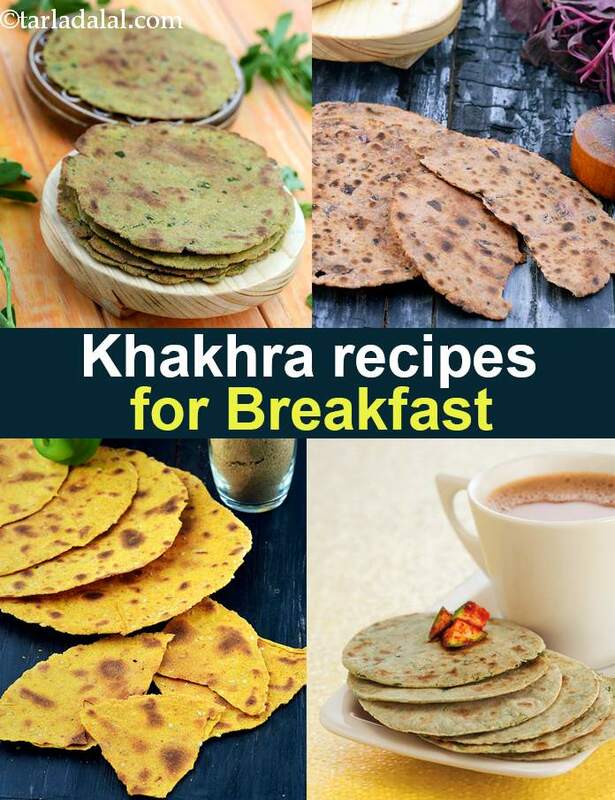 Breakfast Khakhra Recipes, Khakhras Recipe collection. Khakhras are as filling as chapattis, and they have a long shelf life, so you can prepare a large batch when you have time and store them in dry, airtight containers. On a busy morning or when you are travelling, khakhras can conveniently be had for breakfast. Enjoy Masala Khakhra or Bajra Khakhra or Khakhra , with a glass of Sweet Punjabi Lassi in the morning and it is as good as a proper breakfast! We have a collection of khakhra recipes made with 7 different healthy flours. Bajra flour, Ragi flour, Whole wheat flour, Jowar flour, Quinoa flour and Rajgira flour. Always avoid store bought khakhras as its easy to make your breakfast khakhra recipes at home in advance and store them. Basic Khakhra Recipes for breakfast. We have the basic whole wheat khakhra recipe, a famous Gujarati dry snack made from whole wheat flour, salt, oil and water. The dough is rolled out and cooked on a tava with pressure applied till crisp. Khakhras are healthy, quick to make and go with curds. Bajra flour used in Khakhras can be perfect for breakfast or a quick healthy snack. We have the basic bajra khakhra recipe which is subtly flavoured with ginger-garlic paste, green chillies, sesame seeds, turmeric powder, oil and salt. Wholesome bajra methi khakhra recipe made of bajra and whole wheat flour perked up with fenugreek leaves, green chilli paste, and so on, this snack is a perfect accompaniment for tea. The bitterness of methi is surprisingly very pleasant in this creation. It makes you smack your lips and reach for another khakhra! You can make these delicious Bajra Methi Khakhras in bulk and store them in an airtight container to relish at home. Jowar Flour used in Kharkhra recipes. Jowar and sesame khakhra is healthier than plain wheat khakhra, and also more aromatic. These khakhras can be had crisp and warm off the stove, or stored for later use. Oats has found its way into Indian cuisine. From breakfast, to snacks and khakhras. These crisp and tasty Oats and Methi Multiflour Khakhras recipe are full of iron-rich ingredients like fenugreek, jowar and nachni, which not only contribute iron to the recipe, but also improve the flavour and texture of the khakhra remarkably. Khakhra makes a complete breakfast meal when combined with sprouts. Our khakhra with sprouted moong recipe is what i have as a breakfast meal. It's healthy, crunchy, tangy and filling to have. Enjoy our Breakfast Khakhra Recipes, Khakhras Recipe collection and other Breakfast Recipe articles below. Suggested serving size for 100 calories: 2 khakhras with 1/3 cup of dip whole wheat and dill khakhras become interesting with this deliciously chilled low-fat curd dip enhanced with delectable spices. Prepare in advance, enjoy at leisure. Put cabbage while you make green chutney. it makes the chutney green and tasty.